I have made several pilgrimages to foreign lands. In each case I wanted to visit the sites that had been hallowed by the footsteps of our Lord or the apostles. Even so, I familiarized myself with the laws and customs of my host country. St. Augustine felt that this should always be a concern of followers of Christ. We are pilgrims in this world; while we have a duty to “render to Caesar what is Caesar’s,” we should never lose sight of the fact that our true citizenship is in the kingdom of God. Italian theologian Archbishop Bruno Forte has said, “Life is either a pilgrimage or a foretaste of death.” Every day of our lives, we are either tracing the Lord’s footsteps in hopes of sharing in his resurrection, or awaiting a fateful day of death without hope. At the Transfiguration, as the disciples witnessed the appearance of Moses and Elijah with their Master: “This is my beloved Son; listen to him.” And at Calvary, we witness the wordless anguish of a Father for the agony his Son had endured: the ground shook, the sky grew black, and the curtain in the Temple was torn in two. This was the glory and praise that Jesus sought, and that made it possible for him to endure the long journey from the Incarnation to the Cross and Resurrection. There were temptations along the way. The devil tempted Christ to use his own power, instead of his obedience, to win over all the kingdoms of the world. The people wanted to make him a king when he multiplied the loaves and fishes. When he was called good by anyone, he pointed out that God alone was good. And when he approached the hour of his death, Jesus prayed, “I glorified thee on earth, having accomplished the work which thou gavest me to do; and now, Father, glorify thou me in thy own presence with the glory which I had with thee before the world was made” (John 17:4–5). When our earthly pilgrimage is finished, will we be able to say that we have glorified God during our lives? Or did we seek to be glorified by others? Will we have accomplished everything that God desired? One of the most telling—and the saddest—indicators of American cultural values, of what we consider most important as a society, is revealed by the number of cosmetic, appearanceenhancing surgeries that are performed every year. I’m not talking about plastic surgery done to correct birth defects or other serious conditions brought about by illness or accident. I mean the number of otherwise healthy people who are willing to go under the knife to lift a little here, tuck a little there. What does it say about a person’s mental health, to be so insecure that he or she would risk life and limb, just to look a little younger, a little trimmer, a little closer to some arbitrary cultural ideal? And what does it say about the health of a nation, that those most admired never look a day over thirty? Those of us who carry the cross of Christ, who see ourselves as pilgrims headed for that City of God, are bound to see things very differently. We give glory to God in all things, and seek God’s blessing upon all of our undertakings. We will not content ourselves with some self-serving “spiritual quest” that has more to do with love of self than love of God. We understand that physical beauty is transitional at best. What matters most is to become the person God created us to be; which is to be more like Christ. So we refuse to let ourselves get caught up in some endless cycle of trying to become someone we are not. When Jesus told the apostles that he must suffer at the hands of the rulers and be crucified, Peter told him that it would never happen. Jesus said to Peter, “Get behind me Satan!” He understood that God’s way is not our way—and yet, ultimately it is the only way to eternal life. The choice is yours: Which road will you choose? And who will be your companion for the journey? Are you going to believe those who pressure you to conform to the self-indulgent values of the City of Man? Or will you take the higher road, bound for the City of God? 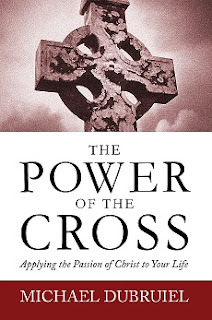 The Power of the Cross by Michael Dubruiel is a book well-suited to daily reading during Lent. The book is available here in pdf version. Daily excerpts will be reprinted in this space during Lent.